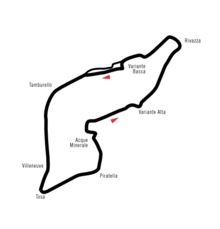 The 1990 San Marino Grand Prix (formally the 10o Gran Premio di San Marino) was a Formula One motor race held on 13 May 1990 at Imola. It was the third race of the 1990 FIA Formula One World Championship. The race was held over 61 laps of the 5.04-kilometre (3.13 mi) circuit for a race distance of 307.44 kilometres (191.03 mi). The race was won by Italian driver Riccardo Patrese, driving a Williams-Renault. It was Patrese's third Grand Prix victory, and his first since the 1983 South African Grand Prix. Until 2018, Patrese held the record for the longest waiting period between two Grand Prix wins, at 99 races. This record was broken by Kimi Räikkönen at the 2018 United States Grand Prix. Austrian driver Gerhard Berger finished second in a McLaren-Honda, with Patrese's compatriot Alessandro Nannini third in a Benetton-Ford. In the run-up to the first European race of the 1990 World Championship, there were a few changes to the grid. Brabham replaced Swiss driver Gregor Foitek with Australian driver David Brabham, the youngest son of team founder Sir Jack Brabham. Foitek moved over to the troubled Onyx team (part-run by his father Karl), replacing Stefan Johansson, who was unhappy at the way the team was being run. David Brabham's older brother Gary had quit the hapless Life team and had been replaced by Italian veteran Bruno Giacomelli, who had last raced in F1 in 1983; he too would fail to pre-qualify. Meanwhile, Emanuele Pirro returned to the Dallara team, having missed the first two races of the season due to hepatitis. Several teams unveiled new cars, with the Tyrrell 019 – designed by Harvey Postlethwaite – drawing much attention as the first F1 car to sport a "high-nose" design with downward-extending supports for the front wing. Pre-qualifying saw both AGSs eliminated without setting a time, Yannick Dalmas withdrawing due to a wrist injury suffered in testing and Gabriele Tarquini losing fuel pressure on his first lap, while Giacomelli set a lap time of 7:16.2, an average of just over 22 mph (35 km/h), after the Life became stuck in third gear. In practice, Benetton's Alessandro Nannini and Minardi's Pierluigi Martini both crashed heavily, Martini cracking his heel and withdrawing from the race as a result. Qualifying saw the McLarens fill the front row, with Ayrton Senna on pole and team-mate Gerhard Berger alongside him. The two Williams were on the second row with Riccardo Patrese ahead of Thierry Boutsen, while the two Ferraris made up the third row, Nigel Mansell ahead of Alain Prost. The top ten was completed by the Tyrrell of Jean Alesi, the Benettons of Nelson Piquet and Nannini, and the Lotus of Derek Warwick. Pirro, who had qualified 21st, started from the back of the grid after his Dallara stalled at the start of the formation lap. At the start, Senna led away from Berger while Boutsen got ahead of Patrese. At Tamburello, Mansell ran wide and kicked up dust, which caused the Leyton House of Ivan Capelli and the second Tyrrell of Satoru Nakajima to collide with each other, while at Tosa Martin Donnelly spun his Lotus, narrowly avoiding other drivers. Meanwhile, Boutsen got past Berger but was unable to close on Senna. The order remained the same until lap 3 when Senna pulled off with a broken wheel rim, allowing Boutsen to take the lead with Berger close behind. Further back, Alesi collided with Piquet at Tosa; both drivers continued. Boutsen led until his Renault engine blew on lap 17, which left Berger ahead of Patrese and Mansell. The Englishman passed Patrese going into Tosa, much to the delight of the Italian fans. Mansell continued to charge, despite being hit by Andrea de Cesaris while trying to lap him and challenged Berger for the lead. On the run up to Villeneuve, Mansell tried to go around the outside, but Berger closed the door, causing Mansell to spin dramatically. The Englishman avoided hitting anything and ended up pointing in the right direction, he continued in second place, however, dirt and debris had entered Mansell's engine, causing it to overheat and blow-up a few laps later. Mansell's demise left Berger ahead of Patrese, who went through into the lead on lap 51. Nannini and Prost battled over third place, with Nannini winning out. Patrese duly won his first race since the 1983 South African Grand Prix, leading home Berger, Nannini, Prost, Piquet, and Alesi. With 98 races between victories, Patrese claimed the record for most starts between wins - a record that would be taken 28 years later by Kimi Räikkönen, who started 113 races between winning the 2013 Australian Grand Prix and the 2018 United States Grand Prix. ^ "Motor Racing Programme Covers: 1990". The Programme Covers Project. Retrieved 17 February 2018. ^ Lynch, Steven (20 November 2015). "Ask Steven: What's the record for the longest wait between Grand Prix victories?". ESPN. Retrieved 3 January 2018. ^ "1990 San Marino Grand Prix". formula1.com. Archived from the original on 21 December 2014. Retrieved 23 December 2015. 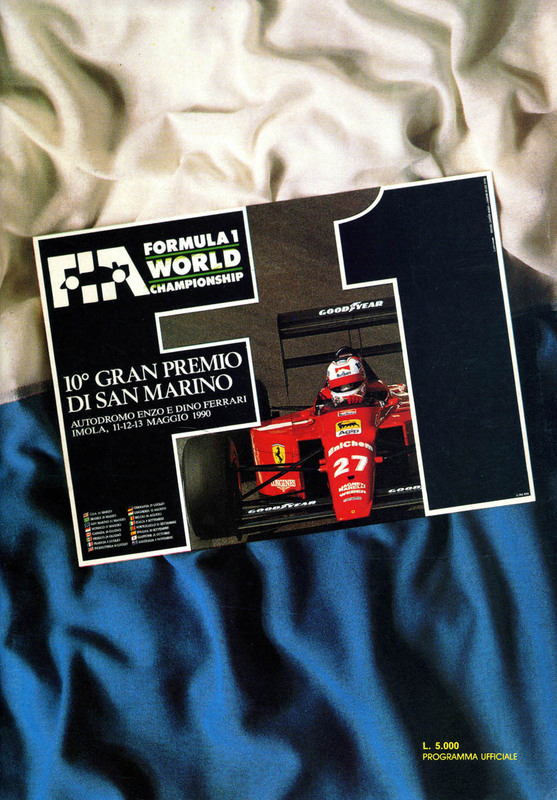 ^ a b "San Marino 1990 - Championship • STATS F1". www.statsf1.com. Retrieved 20 March 2019.